I’m not sad to see the disbanding of police horse patrol as they were mainly used against demonstrators. I know I will receive flak for this, but I for one, am not at all sorry to see the San Diego Police Department horse patrol disbanded and the horses sold due to budgetary reasons. Why? Because the police horse patrol was mainly used for crowd control and was constantly used to intimidate peaceful demonstrators in San Diego over the years. I know the horses are cute and every kid – including mine when he was small -wants to pet them and every tourist wants to have their photo taken with them. The horses when they’re just standing there are cute. But that was not how the police or the City of San Diego used them. Place a uniformed cop on top the large animal and place that rider and horse in a line with a bunch of other cops on horses – and you have a mighty intimidating front. 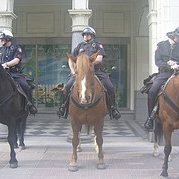 I have been in numerous peaceful anti-war demonstrations downtown where the mounted police followed the marches to ensure that there were no stragglers from the protest. The mounted patrol would follow close too, and as moms with baby carriages, or people just struggling to keep up, or older citizens with canes or even in wheelchairs would drop behind the main body of marchers, these horses would come right up to the stragglers and physically force them along. The cop riders use their mounts with aggression and don’t stop for an innocent straggler. Nope. A few years back, a number of anti-war protesters were actually stepped on and injured by the horses in Balboa Park. It’s not like the horses themselves were mean. It was how they were used. A cop on a horse can quickly cover a bit of ground and has a great view. They’ve been used in Ocean Beach for patrol purposes, I know. The mounted patrol began in 1934 in Balboa Park. It ended in 1948 but was re-established in 1983. Today’s Union-Tribune ran an account that despite some last-minute fund raising efforts by civilians, the horses will be auctioned off. It is sad in a sense, but then again, this is not the Wild West. The mounted patrol likely helped keep many of those demonstrations peaceful. Even when the vast majority of peaceful people protest anything, the opposition protesters and a few troublemakers can easily ruin things for everyone. Often people who care nothing about a cause will show up when the cameras are there- just to get attention. And it was not mainly used for crowd control. They spent most of their time taking pictures with tourists… that is a waste of time. obfuzz, a tip of the hat to you for responding. I could say ‘horse feathers!’ to you pal, but I won’t. I don’t agree with you but that’s okay. Many of the demos that I went to did not have any counter-demonstrators, and by far the vast majority were very peaceful. The mounted patrol and the motorcycle patrol were brought in to show us how easily we could be maneuvered and monitored and manipulated. 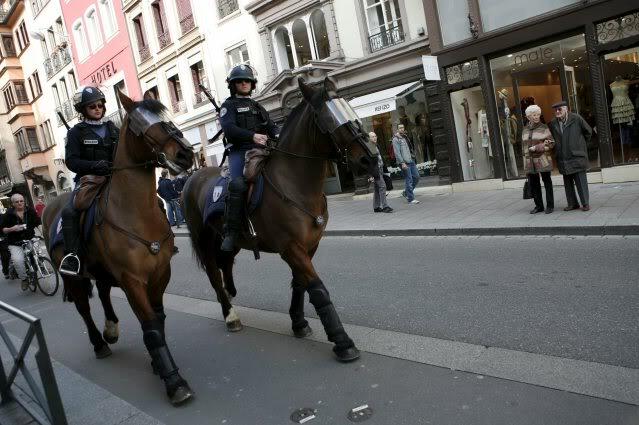 Nothing like a flank of cops on horses with everyone having shields on – even the horses to show who’s boss. HOORAY for gittin’ rid of the horses. OF COURSE, they were used to hassle people, what do y’all think the cops are for but to hassle the have nots in favor & “protection” of the haves? & left horse puckey everywhere on our beaches. Now if they wd only git rid of the “Cop Shop” in the pier parking lot. All that shd save enuf $$$$ to keep the fire rings! Speaking about horse puckey… I once not too long ago witnessed a scene between a woman dog owner and a male cop on a horse. The cop had approached the woman because her dog was not on a lease and had complained to her without writing anything that her dog had shat in the grass. Somewhat taken aback, the woman asked who was going to clean up the horse puckey out in the parking lot? The cop then wrote her a ticket. The so-called cop shop or police trailer is used by meter maids and men. They have to go somewhere to write their tickets up, and the old Newport Ave office closed long ago. The City desperately needs money, money is generated by tickets, so – all power to the ticketeers ! Let’s keep the trailer (just kiddin Dan, Steven, justmy2cents) and maybe we can raise enough funds through tickets that will pay for the fire pits. So, let’s keep the trailer there (does the city pay rent? It’s the city’s parking lot) and generate fire pit money. In fact, let’s sponsor a campaign where OB residents turn themselves in to the meter people – and police – whenever they commit a traffic violation voluntarily in order to help generate this fire pit ticket money. Of course, it goes without saying that we wouldn’t be promoting dangerous driving or behavior. So, park in the red zone! Raise money for the fire pits! Pits don’t cost a dime, you take a shovel, you dig a pit, you’re done. It’s the cement rings is what costs the taxpayer money. I know that certain folks at the Rag can’t wrap their minds around the fact that you can have a square ring but it’s a fact. The term Pits also has a very negative connotation so I can see why the Rag’s attempt to rally support for pits rather than rings is failing. But Dave, support is not failing, all of the fire rings (or fire pits, or whatever) have been adopted! Older Article: Should OB Have a Town Hall Meeting on the Homeless Youth and the Police ? Frank Gormlie April 23, 2019 at 5:25 pm on News and Notes from Ocean Beach and Point Loma – April 2019You're right, but I checked the original source and that's what it reports.